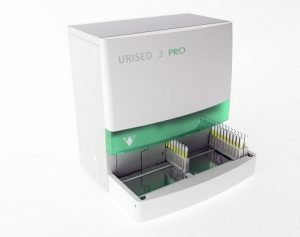 The only consumable of the UriSed 3 PRO sediment analyzer is the UriSed Cuvette, which is a one-time use high optical quality polycarbonate chamber. Cuvettes are stored in containers of 50 pieces. An operator can load 12 containers (600 cuvettes) at once into the UriSed 3 PRO—enough to accommodate a typical day of sample anaylsis in most laboratories. 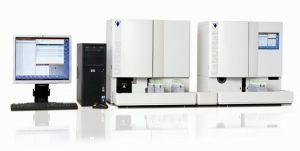 The analyzer automatically fills 200 µl of sample into the individual cuvettes. The filled cuvettes are centrifuged and forwarded to the microscope position where a built-in camera takes images of the settled urine particles. 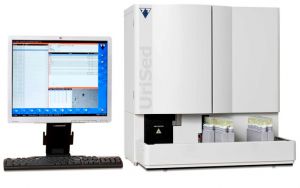 The UriSed 2 is a high throughput, automated urine sediment analyzer, which improves accuracy, reproducibility, safety, and productivity in laboratories by producing whole field of view microscopic images of urine sediment and automatically classifying and counting urine sediment particles in the images. This instrument belongs to the Facelift generation of the UriSed technology. Its operation is based on the same patented measurement technique, which is actually the automation of traditional manual microscopy. Working without any special liquid reagents UriSed 2 performs sample preparation, takes several images of each sample through a built-in microscope, and evaluates the images using the Auto Image Evaluation Module (AIEM), which is high-quality image processing software. Like its predecessor, UriSed 2 offers a reliable and standardized method for evaluating urine sedimentation. In addition, its design is harmonized with that of the new LabUMat 2 and it features improved performance. 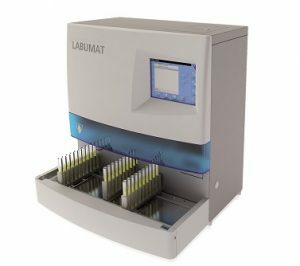 The UriSed 2 microscopic urine sediment analyzer is a stand-alone instrument, which can be connected to the LabUMat 2 urine analyzer. Together, the two instruments make up a Complete Urine Laboratory System. NEW CATEGORY IN URINE SEDIMENT ANALYSIS! The new UriSed mini is a highly effective tool in a wide range of medical and clinical settings such as hospitals, clinics, accident and emergency departments and outpatient laboratories. 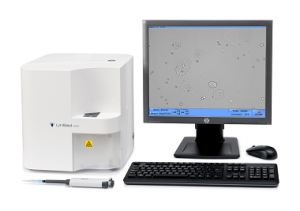 UriSed Mini utilizes the traditional gold standard method while eliminating the most time-consuming and operator-dependent procedures in laboratories performing manual microscopy. In addition it can also serve as a backup instrument of automated sediment analyzers. The operation of this analyzer is based on the patented UriSed Technology, which is actually the automation of traditional manual microscopy. The operator only needs to load a special disposable cuvette and inject native urine sample into it using a manual pipette. Working without any special liquid reagents, UriSed mini performs all the rest automatically. After centrifuging the sample, it takes 15 whole field of view images of each sample through a built-in microscope, and evaluates them using the Auto Image Evaluation Module (AIEM) which is a high-quality image processing software. The images and results can be viewed and validated in the user software of the UriSed mini. The new DocUReader 2 Pro is designed for physician’s offices and smaller laboratories to read and evaluate the LabStrip U11 Plus urine test strips. Although the instrument is intended for in vitro diagnostic use by qualified physicians and laboratory staff, no special training is required to use them. 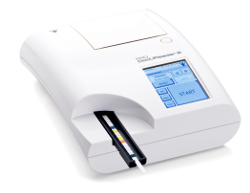 DocUReader 2 Pro is the ideal choice for point-of-care urinalysis testing. 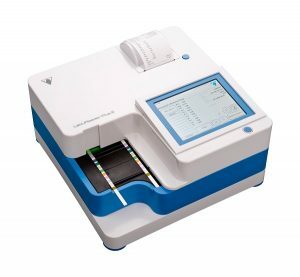 The compact design of this lightweight instrument offers the broadest features and highest flexibility available on any desktop size urine analyzer. The system offers excellent accuracy, simple operation, high flexibility and connectivity as well as enhanced security and quality control functions. Each test strip has 11 measuring zones that contain sensitive reagents. The color of the test field changes as the result of a chemical reaction after to urine contact. 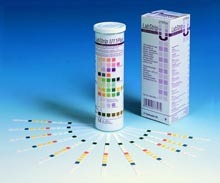 This coloration can be detected by 77 Elektronika’s urine analyzers or by visual inspection.